On Thursday 19th July the children form Year 6 took part in their Graduation Ceremony. 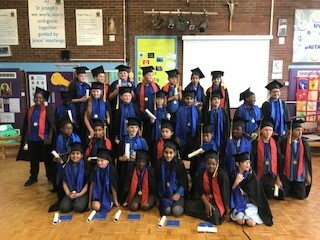 The children were joined by both their school family and lots of members of their own families and friends from home who came to hear each child’s success’ celebrated. Each child received a special leavers medal, scroll and autograph book! We are very proud of all of the Year 6 children and all of their success’ – well done children! This entry was posted on Thursday, July 19th, 2018 at 3:50 pm	and is filed under Announcements, Assemblies, Awards, Catholic Life. You can follow any responses to this entry through the RSS 2.0 feed. You can leave a response, or trackback from your own site.